TRMA is a synonym of “Rogers syndrome”. It derives from the first report of the disease in a child with diabetes mellitus, sensor neural deafness and megaloblastic anemia who responded to thiamine treatment. On case report suggest an alternative name for the syndrome : “thiamine-responsive myelodysplasia”. Thiamine -responsive megaloblastic anemia (TRMA) syndrome is an uncommon autosomal recessive disorder. 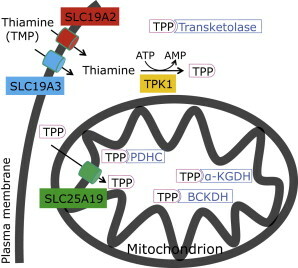 This disease is caused by mutation in the gene ,SLC19A2,with a height-affinity transporter, which disturbs the active thiamine uptake into cells. Major features include megaloblastic anemia, diabets mellitus and sensorineural deafness. Individuals with TRMA begin to show symptoms of megaloblastic anemia between infancy and adolescence. Mutations in the SLC19A2 gene cause thiamine-responsive megaloblastic anemia syndrome. This gene has a high-affinity thiamine transporter 1, which transports thiamine into cells. The official name of this gene is “solute carrier family 19 (thiamine transporter), member 2”. The SLC19A2 gene belongs to a family of genes called SLC (solute carrier). This family is a group of genes that share important characteristics. This gene encoder has a high-affinity thiamine transporter 1, which is located on the surface of cell, where it works to bring vitamin B1 (thiamine) into cells. Thiamine helps the body convert carbohydrates into Energy, and it is also essential for the functioning of the heart, muscle and nervous system. This vitamin must be obtained from the diet because the body cannot produce thiamine on its own. Many different foods contain thiamine, including grains, pasta, fortified breads, cereals, fish and beans. Defective RNA ribose synthesis caused by intracellular thiamine deficiency is thought to be the cause of megaloblastic changes in TRMA. Recently, SLC19A2 in mouse models were developed. At least 17 mutations in the SLC19A2 gene have been found to cause TRMA syndrome. Most of these mutations lead to the production of a abnormally short, non-functional thiamine transport 1. To date,33 families with 28 distinct mutations have been identified. Homozygosity by descent has been the most common finding. Sequence analysis of SLC19A2 DNA is available clinically. Recent studies showed that a second high-affinity thiamine transporter, SLC19A3, has major roles in intestinal thiamine uptake in mouse models, accounting for the absence of overt thiamine deficiency in persons with TRMA. The difference in distribution of exspression of the two thiamine transporter is critical in TRMA:in pancreatic endocrine cells’ the expression of SLC19A2 is much higher than that of SLC19A3 and TRMA-associated SLC19A2 mutants distrupt thiamine uptake significantly. In bone marrow and coclea SLC19A3 isn’t expressed. Megaloblastic anemia. The earliest findings of significant bone marrow problems have been in the first year of life and the latest in teenage years. microcytic, which suggests a persistent erythropoietic anormality. Progressive sensorineural deafness. Hearing defects have been present in every individual at the earliest age examined. Progressive sensorineural hearing loss is irreversible and may not be prevented by thiamine treatment. The basis of the sensorineural deafness is obscure; it is not known if the deafness is caused by abnormalities of the cochlea or of the auditory nerve. However, recent animal studies suggest that selective inner hair cell loss in the cochlea could be the cause of hearing defects in TRMA. Diabetes Mellitus. these individuals develop diabetes during childhood, they don’t have the from of disease that develops most often in children, called type 1(autoimmune) diabetes. These people usually require insulin to treat their diabetes. In some cases, the treatment with thiamine can reduce the amount of insulin a person needs. Optic atrophy. Abnormal appearance of the retina and functional retinal dystrophy has been reported. Borgna-Pignatti et al (1989) have reported it as DIDMOAD ( diabetes insipidus, diabetes mellitus, optic atrophy and deafness). It has in retrospect been shown by genetic analysis to have TRMA, but optic atrophy was not known to be a finding of this syndrome at the time. Cardiovascular abnormalities, including sudden death, stroke, high-output heart failure, paroxysmal atrial tachycardia and congenital heart defects have been reported in literature. There isn’t genothype-phenotype correlation discerned. SLC19A2 is a homozygous null mutations, regardless of position within the gene sequence as results in missense mutations. Fewer than 40 pedigrees are known. TRMA is exceedingly rare outside of consanguineous pairings or isolated populations. Same cases are been observed in Istraeli Arab and Lebanese populations, and kindreds from Brazil, Japan, Oman, Tunisia und Italy (Venetian and other), Iran and Pakistan. Genetic counselling for related risk and DNA banking. Peripheral blood count and bone marrow analysis for evidence of megaloblastic anemia. Serum folate concentration, serum vitamin B12 concentration and serum iron studies to exclude other patology. Fasting serum glucose concentration, oral glucose tolerance test (OGTT) and urine analysis to diagnose diabete mellitus. Prenatal diagnosis for pregnancies at increased risk is possible by analysis of DNA extracted from fetal cells obtaines by amniocentesis usually performed at approximately 15-18 weeks’ gestation or chorionic villus sampling (CVS) at approximately ten to 12 weeks’ gestation. Both diseases-causing alleles of an affected family member must be identified before prenatal testing can be performed. Early administration of pharmacologic doses of oral thiamine (vitamin B1) (25-75mg/day ) ameliorates the megaloblastic anemia and the diabetes mellitus. It may prevent further deterioration of hearing function. The treatment is with a pharmacologic doses (25-75 mg/day) of thiamine in affected individuals. This high-dose thiamine may ameliorate mellitus in the short term and perhaps even for decades. This treatment from birth or pregnancy could reduce the hearing defect is a matter of conjecture. Other possible treatment is the stem cell transplantation. It could be great for the marrow affected by TRMA, but vitamin B1 treatment is until now satisfactory. The transplantation has more risk.